All transactions are safe and secure with a reliable history in online purchasing behind each of our associates. Buy the I Heart Zombies t-shirt to own Zombieland clothing and merchandise. 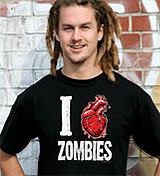 These I Love Zombies t-shirts are for any and all horror fans. The I Heart Zombies design featuring a realistic heart is available on either a black tee or a black and white ringer tee. Pick which one best suits your personality and then get back to doing your cardio. After all, it isn't survival rule number one for no reason. We suggest the Zombieland soundtrack to keep you pumped up during your workout. Stay alive by obeying the zombie rules. In addition to the I Heart Zombies tee above, browse the Zombieland Clothing Gallery for more apparel like men's and women's clothes, kids shirts or hoodies.